The Hare and Hounds is an old building dating back to the early 1800s and has stood as a pub since 1907. 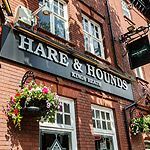 Retaining many original features, the Hare and Hounds nowadays features regular live music nights spanning a whole host of musical genres. Prices vary depending on act. From free to £15. Most shows are usually 18+, however there are some 14+ events, please check with the venue. Courtyard in the middle of the building plus seating & tables on York Road. What did you think of Hare and Hounds? Great entertainment. Fantastic food and an atmosphere that would beat the biggest music venues, Hare and Hounds is kicking!! Fantastic venue in Kings Heath. There always seems to be something on every night of the week and manages to attract some big names with the likes of Basement Jaxx, Norman Jay, Steve Lawler, Giles Peterson, Jazzie B, Crazy P and Quantic Soul Orchestra all having played there in the past. Ive had some truly great nights here with my mates. Always has great bands, especially that up and coming band Copious. I see they're playing tonight....I'm grabbing some friends and I'm there! Sort of takes the melancholy out of the mid work week.